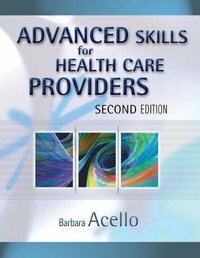 This book was written to prepare the nursing assistant or patient care technician to provide advanced patient care procedures. The book includes content on sterile procedures, including preparing and working with a sterile field, using sterile technique, and performing sterile dressing changes, wet to dry dressings. Venipuncture technique is covered in several chapters as well as intravenous procedures and many other advanced skills. The importance of reporting information and observations to the licensed supervisor is emphasized throughout the book. To this end, most chapters contain special text boxes listing observations to be reported and recorded. Added highlights within the text narrative include safety and infection control alerts, and age related information; information that is important to the student and in keeping with the latest health care trends.